A Time Trigger is used to trigger a macro at a certain time, or if used with sensor triggers, it can be used to only allow those sensors to trigger at certain times. Name - For this field, enter something that briefly and uniquely describes the time trigger. This name is used in the list of triggers. Description - Use this field if you have any more information you want to put about the time trigger. This will also show up in the list of triggers. Start Date - This indicates the start date of the trigger. If the time trigger is set to recur, this date will determine the starting point. If it is not recurring, it will be a one time trigger that will only trigger on that date. The Start Time settings are for the time to start the macro. You can choose to start at a particular time, or at dusk or dawn or some amount before or after dusk or dawn. Start Time - This is the time when you that the macro to be triggered. You can select a portion of the time and use the up and down arrows on this control to change that portion, or you can just type the time. End time is when the trigger will no longer trigger. 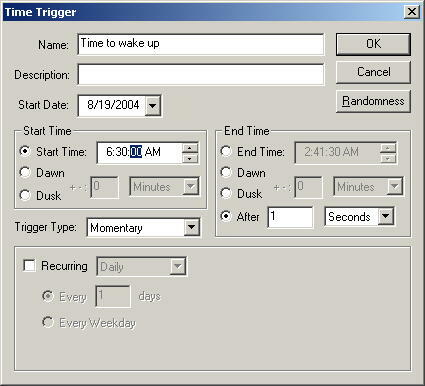 If the trigger type is "Momentary", it is not really necessary to set an end time since it will trigger once and then ignore the trigger for the rest of the time. It checks all triggers about 10 times per second, so if the trigger duration (After) is set to 1 second, that's plenty. If you have the trigger type set to "Continuous", then you're saying you want it to trigger for a longer period of time. This is usually used with with other triggers where all the triggers must be triggered before the macro will start. For instance, if you have a sensor that you want to trigger a macro, but only between 8:00 AM and 5:00 PM, then on the macro window you would add a sensor trigger and add a time trigger and have the Trigger When value set to All Triggers Active. The time trigger would be set to start at 8:00 AM and end at 5:00 PM and the type would be set to Continuous. End Time - This is the time that you want the trigger to stop triggering. You can select a portion of the time and use the up and down arrows on this control to change that portion, or you can just type the time. Trigger Type - Trigger type can be set to "Momentary" so that once it is triggered, it will not trigger again until the next time it is supposed to recur (if ever). This setting is usually used if it is the only trigger for a macro. It can also be set to "Continuous", in which case the trigger will be in a triggered state for the entire time between the selected Start Time and End Time. This is usually used if you are limiting the times that a sensor trigger will be affective. If the Recurring checkbox is checked, it can be set to recur Periodically, Daily, Weekly, Monthly, or Yearly. It will use the same start and end times that you set above for each day, although in the case of Hourly, it will just use that as the starting point. Recurring Periodically every n units - Here you can set it up to recur regularly every hour, every other hour, every 20 seconds, every 30 minutes, or whatever you please. Recurring Daily Every n days - You can set it to recur once every one day, once every other day, once every 3 days, etc. Recurring Daily Every Weekday - This will recur every day Monday - Friday, not Saturday or Sunday. Recurring Weekly every n weeks on ? days - Here you can choose to make it recur every week, every other week, etc., on any days of the week you like. Just check the days you want it to trigger on, and uncheck the days you don't want it to trigger on. Recurring Monthly on day n of every n months - This will make the time trigger recur on the n'th day of very every n'th months. So if you wanted it to trigger on the 3rd day every other month, you would set the first value to 3 and the second value to 2. Recurring Monthly on the n'th day of week of every n'th months - This will cause the trigger to trigger every n'th day of the week of every n'th month. For instance, if you want it to trigger on the 2nd Tuesday of every 3rd month, you would set the three fields to Second, Tuesday, and 3. Recurring Monthly on the end of every n'th month - Not every month has the same number of days in it, but this option makes it easy to trigger at the end of every month, every other month, etc. Recurring Yearly Every month day - This one will make it trigger every year on a particular day of a particular month. So if you want it to alert you about taxes, you could enter April 15 (unless you don't like doing things at the last minute). Recurring Yearly on the n'th day of week of month - This will cause the trigger to trigger every n'th day of the week of month each year. For instance, if you want it to trigger on the 2nd Tuesday of March every year, you would set the three fields to Second, Tuesday, and March.